The Worksheets page provides a powerful and versatile interface for creating and submitting SQL queries, as well as performing most other DML and all DDL operations, and viewing the results as your statements complete. Running ad hoc queries and performing other SQL operations. Opening multiple, concurrent worksheets, each with its own separate session, allowing you to run queries in different worksheets with different contexts without any degradation in UI performance. Saving a worksheet for later use. Opening a worksheet from your library of saved worksheets. Saved worksheets are not accessible outside of the Snowflake web interface. Saved worksheets cannot currently be shared with other users. Loading SQL script files from your workstation or network into a worksheet. After you’ve loaded a script file, you can optionally edit and save it to your library of saved worksheets. Logging out without losing your work. 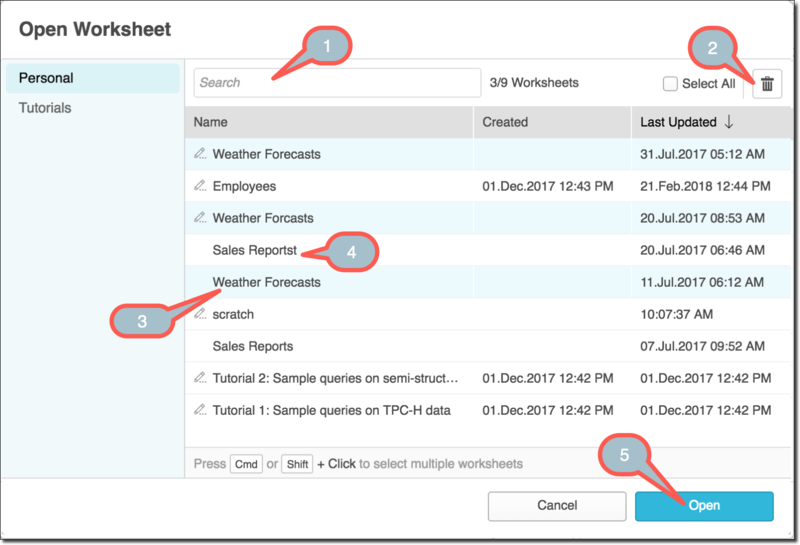 Snowflake retains the static contents of each worksheet, so you can log in again later and resume working where you left off. Snowflake displays the worksheets that were open when you logged out. When switching between open worksheets. When closing and reopening the same worksheet. Specifying a different role for each worksheet and switching roles without losing your work. You can execute specific statements in a worksheet, then switch roles before continuing your work in the same worksheet. Your current interface role determines the default role for worksheets that you open, but the worksheets are not tied to the interface role. Each worksheet has its own role that can be set independently. Logging into Snowflake in another browser or tab. Any worksheet changes you made in one Snowflake instance persist to the other instance after a minute or two. You can continue working in the other browser (or tab) without re-entering your work. Refreshing your browser, if necessary. If you’re in the middle of running queries, they will resume running when the refresh is completed. Note that if you log out of Snowflake, any active queries stop running. Resizing the current warehouse to dynamically increase or decrease the compute resources utilized for executing your queries and other DML statements. Exporting the result for a selected query/statement (if the result is still available). For more information, see Exporting Query Results. Snowflake automatically saves worksheets as you type and persists the current state of a worksheet between user sessions. To organize your worksheets, double-click on the worksheet label in the tab (e.g. Worksheet 2) and type a new, more meaningful name for the worksheet (e.g. Sales Analysis). To open a closed worksheet, click the down-arrow to the right of the open worksheet tabs, and click Open Worksheet. The Open Worksheet dialog opens. Search for individual worksheets by label. Enter text in the Search field. The list of existing worksheets is filtered automatically. Edit worksheet labels. Double-click on a worksheet label, and edit the text. Worksheet labels are limited to 255 characters. Open or delete one or more worksheets. Select a single worksheet by clicking on the table row for the worksheet. To select multiple worksheets, click the CMD (Mac) or CTRL (Windows) key once and then click on multiple table rows. Click on the Open button to open the worksheets in separate tabs, or click on the Delete button to delete the worksheets. The object browser enables users to explore all databases, schemas, tables, and views accessible by the role selected for a worksheet. The list of databases and other objects refreshes automatically when the worksheet context is changed. Users can also click the refresh button at the top of the object browser to view object changes immediately. The object browser can be collapsed at any time to make more room for the SQL editor and results/history panes. Click on a database or schema to explore the database objects contained within. You can then drill down to the table and view level. Data previews are limited to the first 100 rows. An active warehouse is required to preview data. When the data for a view is previewed, a SQL Text button appears in the data preview pane. Click this button to see the SQL statement in the current view description. This is a shortcut to clicking on the Context bar in the upper right and selecting the database/schema from the dropdown menus. Search for databases, schemas, tables, and views using the Find database objects field. Note that searches are “starts with” searches, and are also case-insensitive unless the search string is enclosed in double quotes. You can also search within a database or schema using the search icon that appears for the item when you hover over it in the object browser. Click the context menu to select a different active warehouse for the worksheet. 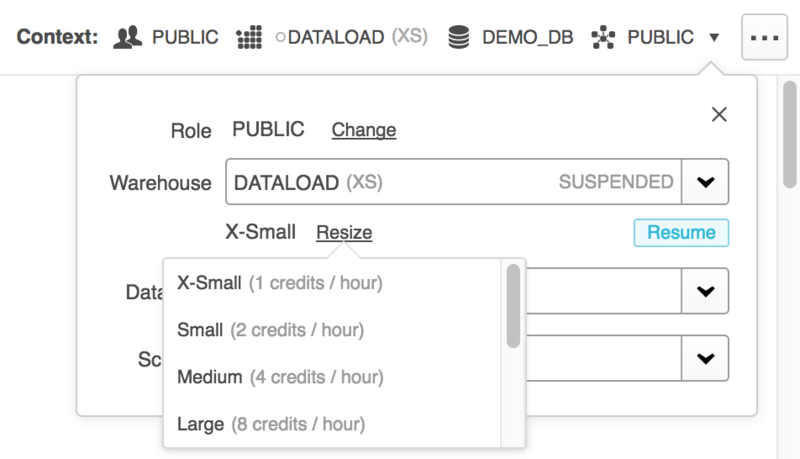 You can resume or suspend the selected warehouse, or resize the warehouse. The query details and results displayed in the worksheet are only maintained for your current user session. If you log out of the web interface and log back in, the results from your previous session are no longer displayed in the worksheet; however, you can use the History page to see queries you executed in previous sessions. Place your cursor anywhere within a query (without selecting it). Select the All Queries checkbox. Select one or more contiguous queries. Click the Run button. Snowflake displays a confirmation dialog, asking whether you wish to execute the selected queries. While queries are running, the Run button changes to an Abort button. Click this button to abort the running queries. 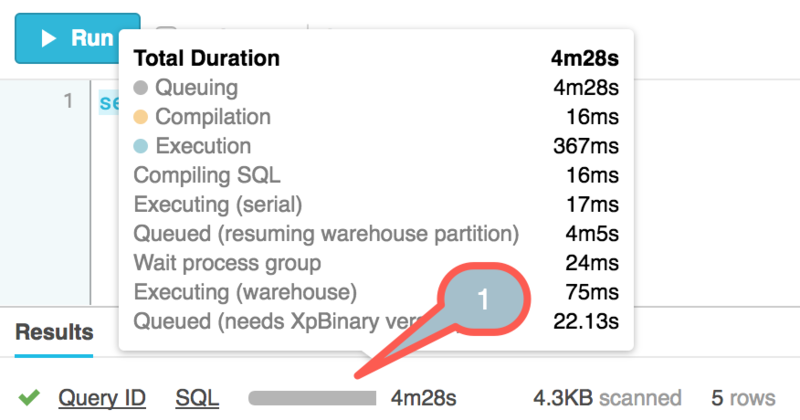 When a query is executed, a status bar displays the current total query duration. Hover over the bar to see a breakdown of the duration. Click the Query ID link to explore query details. A popover provides links to copy the query ID to your operating system’s temporary memory or to navigate to the query history. Right square brackets, ], to indent the line(s) the number of brackets typed. Left square brackets, [ , to outdent the line(s) the number of brackets typed. If a line is indented, all new lines after the indented line are automatically indented the same number of blank spaces. To comment out a line (or multiple lines), place the cursor anywhere in the line (or highlight the desired lines), hold down the [CMD] (Mac) or [CTRL] (Windows) key and type a forward slash, /. To enable or disable text highlighting in all open worksheets, place the cursor anywhere in a worksheet, hold down the [SHIFT]+[CMD] (Mac) or [SHIFT]+[CTRL] (Windows) keys and type the letter K.
To add multiple cursors in the same worksheet, hold down the [CMD] (Mac) or [CTRL] (Windows) key and click in each new location using the mouse left button or the touchpad. To select a text area, hold down the [OPTION] (Mac) or [ALT] (Windows) key. The cursor turns into a crosshair. Cick and drag using the mouse left button or the touchpad. Hold down the [CMD]+[OPT]+[F] (Mac) or [SHIFT]+[CTRL]+[F] (Windows) keys. A Replace field is displayed. Type the string to replace, and press the Enter key. A With field is displayed. Type the replacement string, and press the Enter key. A set of options is displayed. Replace the current instance of the string with the specified replacement and advance to the next instance. Retain the current instance of the string and advance to the next instance. Replace all instances of the string with the specified replacement. Stop searching for instances of the string.